Shua Sperka of Oak Park, the other volunteer driver, packs water bottles into the truck. A message posted in a WhatsApp group of old yeshivah friends quickly developed into a convoy of trucks headed to Houston, including a fully loaded 26-foot truck from Metro Detroit. 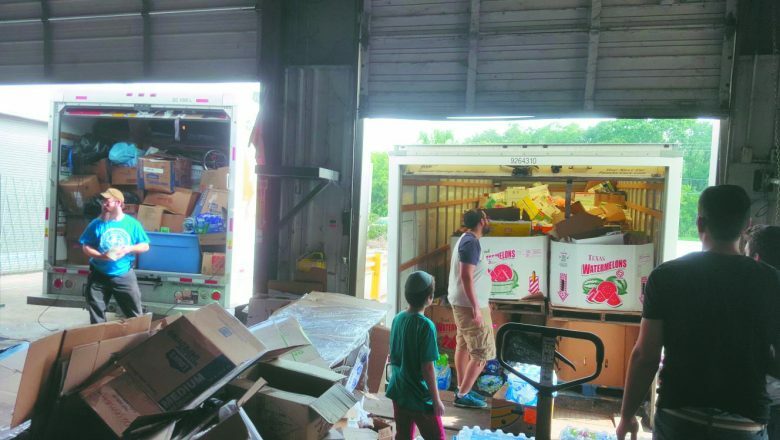 Sara Tugman Bais Chabad Torah Center in West Bloomfield partnered with Yad Ezra Food Pantry in Berkley to launch a communitywide effort to fill and send a truck to the hurricane-ravaged Jewish community of Houston. Silberberg reached out to Lea Luger, Yad Ezra director, who told him they would participate, if: 1) the Houston community wanted us to send a truck with items; 2) a vehicle could get to the impacted area safely; 3) there would be people available to help unload the truck once it arrived; 4) the people in Houston would tell us what they wanted us to send. 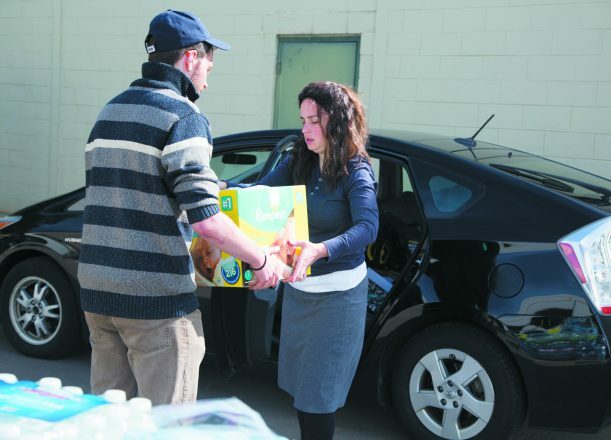 By Thursday morning, a full-fledged, city-wide relief drive was under way. A 26-foot truck was secured; drop-off sites and times were scheduled in West Bloomfield, Southfield and Oak Park; and the public was notified. A rescue team in Houston provided a shopping list of needed items for people to donate. Yad Ezra provided several thousand pounds of canned food as well as the expertise of Yad Ezra Warehouse Manager David Jaffee in packaging the donated goods. Shua Sperka and Shea Margolis, both of Oak Park, volunteered to do the drive. In no time, the truck was completely filled; signs on the truck were created thanks to the efforts of Nechama Lurie, Yad Ezra marketing coordinator. Offers of donations such as mattresses, cots and clothing, as well as offers to help with the driving, had to be turned away simply due to lack of space. 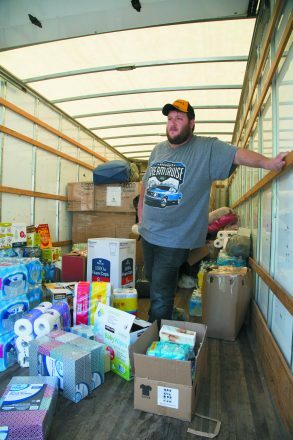 In total, close to 16,000 pounds of food and household necessities were packed in the truck. Volunteers Shua Sperka, 25, and Shea Margolis, 23, both of Oak Park, left Yad Ezra around 10:30 a.m. Sunday, Sept. 3. They drove the truck to a warehouse in Missouri City, just outside of Houston. The trip took them about 24 hours, with only a few stops. The warehouse was well organized by Chabad of Houston. As soon as the truck arrived, volunteers unpacked it quickly. Other donations already filled the space, waiting to be sorted and taken to distribution centers. Sperka and Margolis were given food and directions to the Chabad House, which also owned some adjacent apartments. The drivers were able to sleep, shower and eat. They flew home from Houston late on Labor Day. See an accompanying video at thejewishnews.com. The supplies from Detroit were quickly unpacked in a warehouse where they will be sorted and distributed to those in need in nearby Houston. 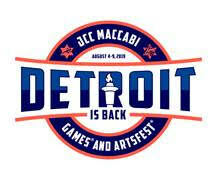 Detroit Federation’s donation site: jewishdetroit.org/news/support-the-relief-efforts-for-victims-of-hurricane-harvey. Jewish Federation of Greater Houston: bit.ly/2j0Bj9D or send checks to Jewish Federation of Greater Houston, 5603 S. Braeswood, Houston, TX 77096. Put Hurricane Relief in the memo. Shaarey Zedek’s Hazzan David Propis, who came here from Houston’s Congregation Beth Yeshurun, created a video prayer, “Heal Us Now,” for those affected by Hurricane Harvey. See it at here. Temple Beth El in Bloomfield Township is partnering with Congregation Beth Israel of Houston to assist its members in rebuilding their lives. The temple is collecting gift cards (Target, Home Depot, etc. ), cash or check of any denomination (TBE will purchase gift cards on your behalf), and will make sure they get to the temple in Houston, where they can be distributed immediately to those in need. 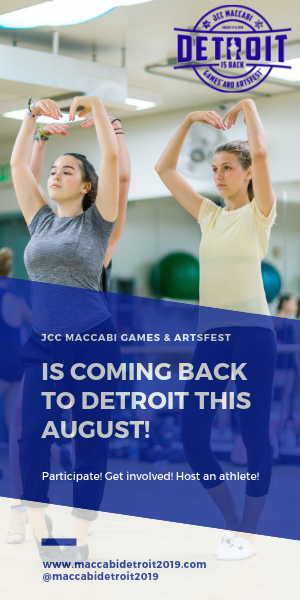 For details, contact Lindsey Fox-Wagner at lfoxwagner@tbeonline.org or (248) 851.1100. The Union for Reform Judaism is collecting donations at urj.org/hurricane-harvey. United Synagogue of Conservative Judaism is collecting donations at uscj.org/Donate/DisasterReliefFund. The Orthodox Union is collecting donations at ou.org/giving/houston-relief-fund. Donate to Nechama: Jewish Response to Disaster: nechamaharvey.funraise.org.